Papua New Guinea’s Minister for the Environment, Conservation and Climate Change, John Pundari, was in Germany last month for the COP23 Climate Change talks, where he urged countries to uphold their climate change promises under the Paris Agreement. Pundari was leading the PNG delegation in Bonn, a role he has become accustomed to having attended numerous international climate conferences as Minister since 2012. In Germany he called on the delegates to secure real and serious action to effectively tackle global warming by cutting carbon emissions. Yet, deforestation of tropical rainforests causes more carbon emissions than all the worlds cars and trucks according to scientists, and PNG has recently become the world’s largest exporter of tropical logs. Even more bizarrely, at the same time Pundari was in Bonn, urging action on climate change, back home in Port Moresby, his companies were providing security services to PNG’s largest logging company, Malaysian owned multi-national Rimbunan Hijau, at its headquarters and a number of other business sites. Papua New Guinea is the world’s largest exporter of tropical logs and RH is the largest logging company operating in the country. From very modest beginnings in PNG, RH has grown to be a dominant economic force with interests across almost all sectors of the economy and has most recently been clear felling forests for palm oil production. The company’s growth has not come without controversy. RH has been regularly accused of illegal and unsustainable logging, human rights abuses and land grabbing. Accusations that have been supported by official inquiries and government reports. In Port Moresby RH operates the countries largest shopping centre, Vision City, newest luxury hotel, The Stanley, and a large supermarket. RH also owns its own airline, the country’s largest circulation newspaper and a mining company among many other businesses. Mr Pundari meanwhile is the owner of several security companies, including Millennium Guards Ltd and Pro-Secure Limited. Both these companies provide security services for RH. 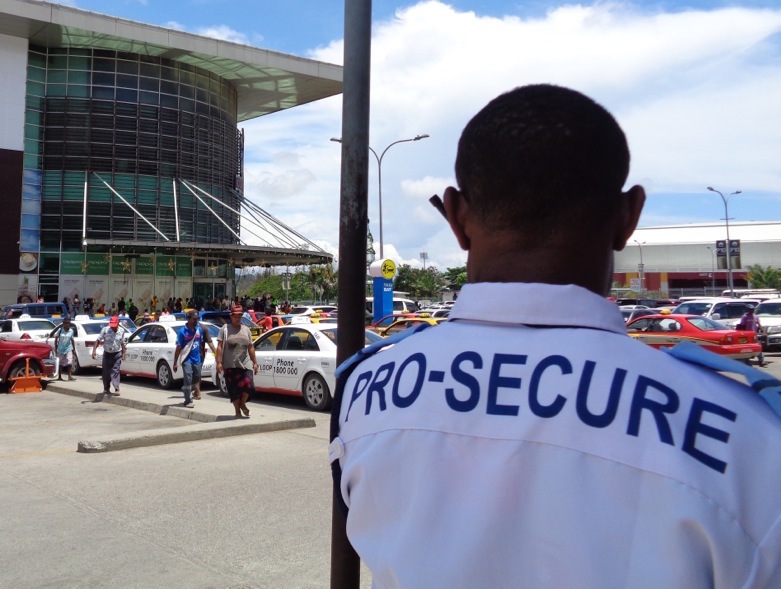 Pro-Secure provides security services at the RH owned Vision City shopping mall and cinema complex, while at the nearby RH Hypermarket and its corporate headquarters on Kennedy Road, Millennium Guards patrol the entrances and car parks. 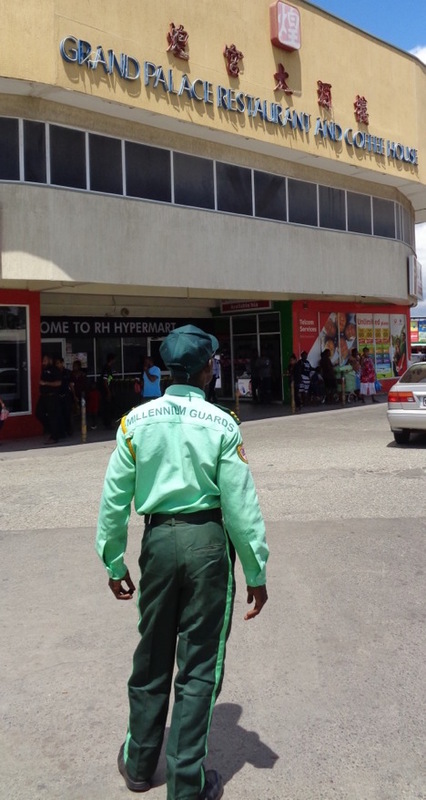 Image: Pro-Secure guard on duty at RH’s Vision City. Pro-Secure is owned by Mr Pundari. Millennium Guards is a substantial business. According to its latest Annual Return filed with the Registrar of Companies, it employs 1,780 staff. In contrast, Pro-Secure was only registered by Mr Pundari in January 2016, it has yet to file any returns. to endanger or diminish respect for and confidence in the integrity of government in Papua New Guinea. It is a matter for the Ombudsman Commission and the courts to decide when these strictures have been beached. The Organic Law on the Duties and Responsibilities of Leadership also requires a Minister in the government to obtain prior approval from the Ombudsman Commission before becoming a shareholder of any company where he might be expected to be placed in a conflict of interest situation. If he does not, he is prima facia guilty of misconduct in office. As PNG, unlike many other Parliamentary democracies, does not have a public register of leaders private interests, it is impossible to know if Mr Pundari has complied with this requirement. Back in Germany, the Managing Director of PNG’s Climate Change and Development Authority, Ruel Yamuna, told the media, the Paris Agreement, signed in 2015, was not only a better deal for the world but was also a victory for PNG with the inclusion of REDD+ (Reducing Emission from Deforestation and Forest Degradation) as a standalone article. Papua New Guinea has long championed REDD as a potential source of funding, although at the same time it has allowed Malaysian companies to continue the expansion of their logging operations. The United Nations is also an enthusiastic champion of REDD. During COP23 the United Nations Development Program hosted a seminar in its Pavilion on how REDD can help countries achieve their Sustainable Development Goals, Minister Pundari was a guest speaker. Back in Port Moresby the UNDP is another organisation that uses the services provided by Mr Pundari’s companies. The Dixie’s Bungalows Resort on the Sogeri Plains, just outside the Port Moresby city boundary, provides a tranquil setting for the workshops, trainings and conferences so beloved by the international aid community. Last month the UNDP organised, with funding assistance from the World Bank, the latest in a series of five-day REDD Expert Training Events at Dixie’s Bungalows. Invited participants from the government, civil society, academia and the private sector were urged to confirm their participation early as the event was likely to be over subscribed. 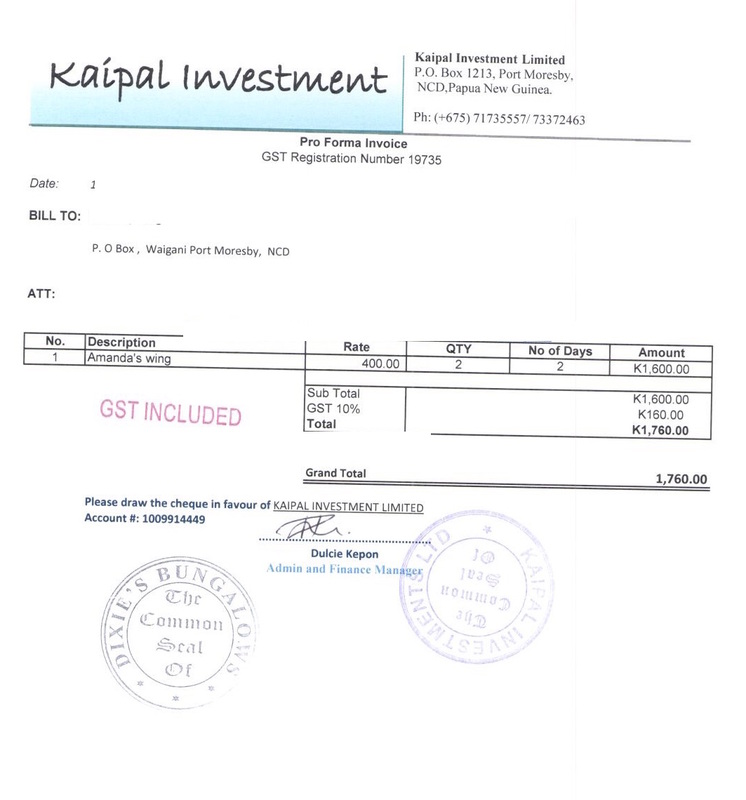 Dixie’s Bungalows is owned and operated by Kaipal Investments, as shown by the Dixie’s invoice below. Kaipal Investments is a company owned by Mr Pundari. 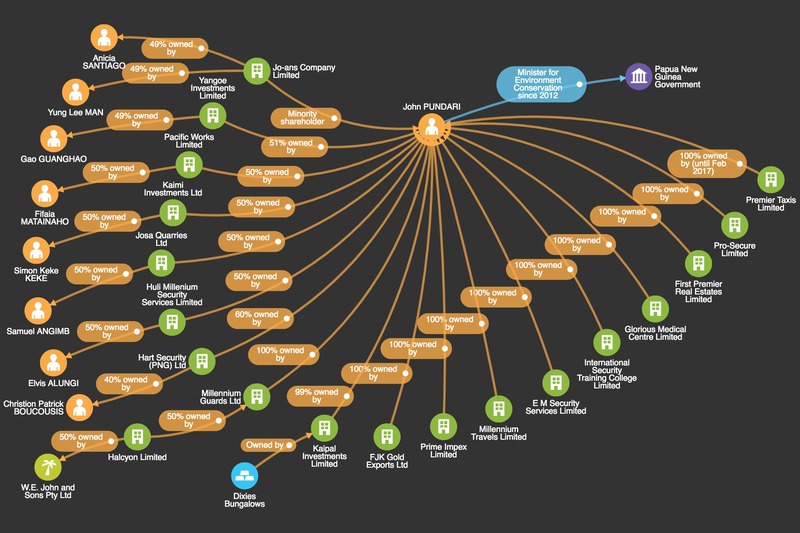 In all PNGi has identified 17 companies owned or jointly owned by Mr Pundari. All have been established since he first entered Parliament in 1992. Millennium Guards and Kaipal Investments alone have net assets of over K26 million. As we have already seen, the Constitution and Leadership Code supposedly guard against conflicts of interest, and there are sounds reasons for this. Office holders must be in a position where they are able to govern in the national interest, without any factors that might skew their judgement. The concern is, that even where the office holder does not intentionally act in a way that is unlawful, if they are in a position where policy or execution of executive powers may affect their business interests, or the interests of business partners, clients or customers, this may cloud their judgement. The principle of governing in the public interest, without vested interests, is so important that failure to adhere to the Leadership Code in this respect can lead to fines and dismissal from office. Mr Pundari’s case raises questions at the heart of the Leadership Code. Is it possible to execute in a clear and unbiased way policies related to the environment and climate change as a Minister, when your private businesses receive considerable patronage from a major multinational corporation, whose primary business is logging? Similarly, when a Minister lends support to policies championed by international bodies such as the UNDP, whilst at the same time receiving patronage from these bodies, there is a risk that in the public eye, this will be seen as an instance of quid pro quo or ‘your scratch my back and I’ll scratch yours’. The Constitution’s founding authors were wise to these risks, and thus paved the way for the robust regulation of public power. But those strictures are only useful in so far as they are applied and upheld.